We are very excited about adding this new state-of-the-art dock to our marina and want to give the members of ZL and ZM Docks first right of refusal, as well as information regarding the placement of ZL Dock onto stationary pilings. Some of you have asked whether another dock might be built in the future on the west side of ZO dock. 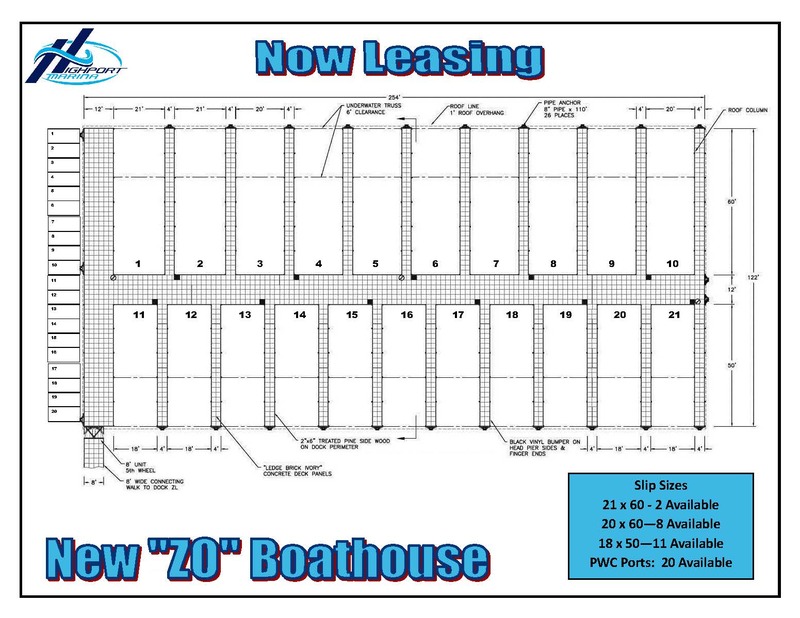 While we cannot rule out the usage of ANY water space inside our leased area to meet future demand, there is no plan to build an additional dock attached to ZO and ZL in the near future. However, keep in mind that even if another dock were to be built in front of ZO, all float-in build-outs are movable and ZO/ZL/ZM dock members will again have first right of refusal on a newly constructed dock in that area. There are of 21 slips to accommodate larger vessels, with 11 slips measuring 50’ x 18’; 8 slips measuring 60’ x 20’ and 2 slips measuring 60’ x 21’. Dock ZO will be built on pilings parallel to ZL Dock, with the 50’ slips facing East and 60’ slips facing west. As a part of the project, ZL Dock will get an upgrade and will be placed on pilings, with removal of the cable anchors to prevent further movement of the dock in windy conditions. The gangway to ZL/ZO docks will be replaced with an 8’ wide gangway which will connect at a right angle to ZO’s dock walkway. This will create additional PWC storage locations for use by ZL and ZO members. Gates will be placed strategically to ensure security of each boathouse. One month’s rent will be required to hold your slip until the dock is completed and slips will be pre-leased on a first-come, first-served basis. Construction will begin in August 2018, and the dock is expected to be ready for occupancy on or about November 30, 2018. Dock improvements will be ‘float-in’ only – which means that whatever you build can be relocated to any other slip of the same width. With the dock going into service during the winter season, you will have a prime opportunity to have our Marina Services department fabricate the improvement of your dreams and have it ready before the busy Spring rush! If you are interested in reserving a slip on Dock ZO, please contact Di Jourden or Samantha Staub in the Leasing Dept. right away!